I had an Extang roll up on my last truck, cost me $200 in 2006 dollars. It lasted me 11 years and still worked fine when I sold the truck, but I really only put the cover on when I needed the bed to be dry, so it might have only seen 2 years total of actual on-truck use. But it was a freaking pain to use, the cover shrank in the winter so it was nearly impossible to snap in place if I took it off. It took about 20 minutes to bolt on the rails too whenever I used the cover. Swore I'd never own another like that. So when I got my F150 I picked up a generic $150 soft tri-fold cover. It was infinitely easier to use and could be installed and removed in about a minute. I couldn't tell a difference in quality, although I only used it for a couple months before I scored a free Solid Fold cover. It basically installs the same way the cheap cover did, but it's hard plastic and makes the bed pretty secure. I think they run for around $1000, and I'm not sure I'd ever pay that much. Maybe $500 tops. I wouldn't be worried about them flying off at high speeds any more than an expensive one. The issue tends to be more in the quality of the vinyl, mainly fading and loosing its stretch. Gator SR2. I wanted a roll up as well since I have a 5.5 ft bed and wanted full access to all 5.5 feet. I will say I'm more than pleased with this cover. It has manual tension controls so you can tighten or loosen as needed. It don't get a drop of water in my bed even when cleaning the truck with a pressure washer. I can roll down the highway at 60 mph and have the small back window open and not hear any flapping. I'm sure I could run at full hwy speeds and not ear flapping, but the wind noise usually gets to me so I close the window. Install was around 25 minutes. I think I paid $379 for mine, but I'm sure you could find another brand that is cheaper. The Gator has a 5 year warranty. I really like this one due to the tailgate seal goes over the top of the tailgate that keeps all water out. Good luck hunting. Your right. 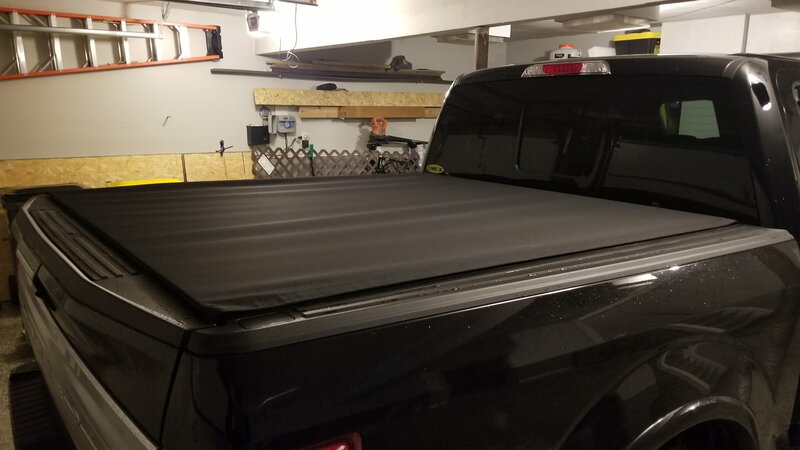 Cheap and expensive Tonneau covers. Really depends on what you need. Bought the Pace Edward Jackrabbit Tonneau for my 2018. Rolls up into a canister, has drainage tubes. Aluminum slats covered by material and locks. The soft top tonneaus are good for flapping in the wind. If I had to buy another one I would buy the solid fold 2.0 by extang. No rails to install and it goes on and off in seconds. I have a set of trac racks I use to carry some big ladders and when I put them on I have to remove the tonneau and the affixed railing system...PITA. Last edited by Stu Cazzo; 02-13-2019 at 01:51 PM. That sounds like a mis aligned garage door and I wonder how many times letting it fling open like that will result in something broken. I like the idea of a solid roll up and this one looks pretty but that continued abuse in my opinion isn't going to end well. I don't trust any dude who's finger nails are as long as this guys in the video! Hi, this looks like a copy of my Retrax Pro. Except mine will stop and lock in any position and no straps. This has a built in groove along the sides to keep it aligned. Have had it now since late 2017 with zero issues. It doesn’t “flap” around. The YouTube video was just so all can see it. When opening/closing I like that it will stop at 12 inch increments in the event you want to carry something in the bed.